Was Rhu minister heretic or saint? ONE of the most astonishing tales in the history of the village of Rhu is what was described at the time as the Row Heresy scandal. In October 1825 the Church of Row, the then name for Rhu, called the Rev John McLeod Campbell to be their minister. The church officials can have had no idea what was to follow, a controversy which lives on to this day. Mr Campbell was 25, well qualified, and a son of the manse who was a fluent Gaelic speaker — important as it was largely a highland parish. He had left his family home at the age of 11 to attend Glasgow University, where he was considered a good Latin scholar. The course he took in Arts and Divinity lasted nine years, and a further year was spent in Edinburgh. After being licensed to preach by the Presbytery of Lorn in 1821, he spent another four years in Edinburgh, mainly in post-graduate work. In May 1825 he was presented by the Duke of Argyll to the parish of Row, and in due course received the call to be their minister. He did not subscribe to the Calvinist teaching that Christ died on the cross for all mankind, but only for some, the others having been decreed for all eternity to be consigned to an eternal destruction. Campbell preached, with true Christian zeal: “Salvation is the free gift of God to all who are willing to receive it.” Soon crowds came to hear him preach, and many returned to the faith they had rejected. But the Establishment did not appreciate his teaching, and even some of his own people formed a cabal and begin a plot against him which soon blossomed into a national scandal and the use of the word heresy. It was to shake the very foundations of the Church of Scotland. A formal complaint was laid against him in the winter of 1828 but failed, but another one in 1930 was found proven by Dumbarton Presbytery and the Synod, and then referred to the General Assembly. In front of the General Assembly in Edinburgh the young village minister provided a vigorous defence of his position, but to no avail. After debating all night, the Assembly reached a decision at 6.15am, and pronounced against him by 119 votes to 6, with many abstentions. He was deposed as a minister of the Church of Scotland, automatically stripped of his priestly and pastoral functions, and forbidden to enter any of the Church’s buildings to preach. His father, the Rev Dr Donald Campbell, minister at Kilninver, near Oban, where his son was born on May 4 1800, told the Assembly: “Moderator, I bow to any decision to which you think it right to come to. Following the Assembly’s verdict, the Presbytery of Lorn instructed Dr Campbell to read from his pulpit at Kilninver a condemnation of his son’s position. This the old man promptly refused to do — a high-spirited action that lives on in local tradition. Back in Row his son preached his farewell sermon in a field to very large numbers of those who had until then been his parishioners. After that he travelled throughout Scotland on horseback, preaching to huge congregations in places including Helensburgh, Bonhill, Greenock and Oban, and later formed a congregation in Glasgow. He published two books, ‘The Nature of the Atonement’ and ‘Thoughts on Revelation’, and he was awarded an honorary doctorate of divinity by Glasgow University. When his health failed he settled in Rosneath, and from his house, Achnashie, he could see his former parish and the tower of the new church built in 1851. He died on February 15 1872 at the age of 72. He is buried in Rosneath Kirkyard, and is commemorated in a memorial window in the Rhu village kirk. Much of the information about his case comes from the 1883 book ‘A Nonogenarian’s Reminiscences of Garelochside and Helensburgh and The People who Dwelt Thereon and Therein’, an account written by Donald MacLeod of details supplied by his uncle, Gabriel MacLeod. Gabriel said that when Campbell began his ministry, he quickly realised that a lot of his congregation were ignorant, indifferent, and in too many cases irreligious and immoral. The question was how to reach their hearts and awaken within them a general interest in matters spiritual. His preaching became distinguished for its fervour, and he was soon the centre of public interest. He realised that people brought up from infancy with a stereotyped theological background ceased after a time to be impressed by it, so he set out his thoughts in a new alternative form. He did not profess to have found a new truth, but a prayerful study of the Bible and earnest desire to bring men under the divine influence, led him to invest the old material with a vitality and earnestness much lacking in many of the pulpit utterances of that period. His thinking found its way into the hearts of his parishioners, but also others over a large area. But it alarmed traditionalists and from 1827 became the subject of much discussion. His name and fame began to be tainted with alleged heretical teaching. It was in the summer of 1827 that he first realised that offence was being taken by some with what he taught. His “summer parishioners”, holiday-makers from Glasgow, would discuss the sermons they had heard in Rhu and on their return home mention to their own pastors the emphasis given by the minister of Row to assurance. He for his part did not want to be misunderstood, and so when opportunity offered he tried to make his position clear. 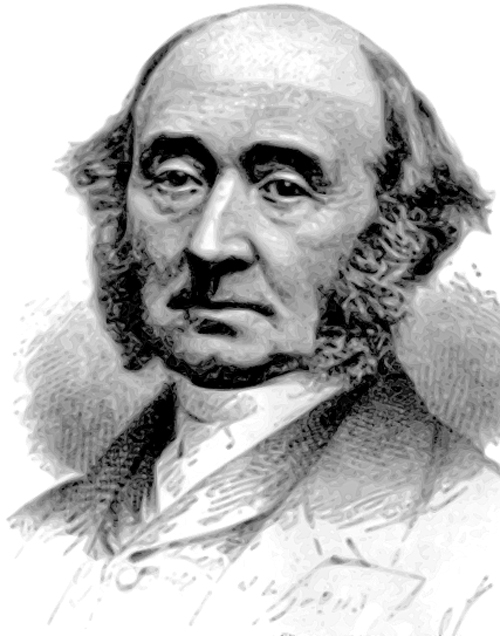 He found himself explaining his views to Glasgow ministers during two successive weeks in December 1827. In 1828 a charge of dangerous and obnoxious preaching failed at Dumbarton Presbytery, but in 1830 a new charge went to the General Assembly and was upheld, despite a counter memorial signed by 80 Row householders. Gabriel MacLeod felt that to an extent Campbell was the architect of his own misfortune, particularly with comments about the Holy Ghost guiding him in the pulpit in the choosing of a suitable text. Gabriel knew the accusers and said they were shrewd, intelligent men who clung to the love of the old form of setting forth the faith, and they entertained a holy horror of anything smacking of a divergence. “It is my candid opinion that the twelve who initiated the 1930 action against Mr Campbell were moved thereto by pure motives and a sincere love for the Church of their fathers,” he added. The Rev John McIntyre, author of ‘John McLeod Campbell — Heretic and Saint’ published in 1963, wrote of him: “I would maintain that John McLeod Campbell has another claim upon our attention and indeed upon our affection. “For not only was he a theologian but he was also a saint who, if one may use the words without irreverence, when he was reviled and in his life he showed the charity of the Christ whose work and person he tried to understand and interpret. “His mind may, at times, have lacked clarity; his heart rarely failed in charity; he was indeed one never tempted to forget the meekness and gentleness of Christ. On April 13 1871, a year before his death and on the 40th anniversary of his appearance at the bar of the Synod, a number of his friends met him in Glasgow and made a presentation on behalf of his admirers. The address at this simple ceremony was given by Norman MacLeod of the Barony Church in Glasgow, and it indicates very clearly how the one-time heretic was now regarded. 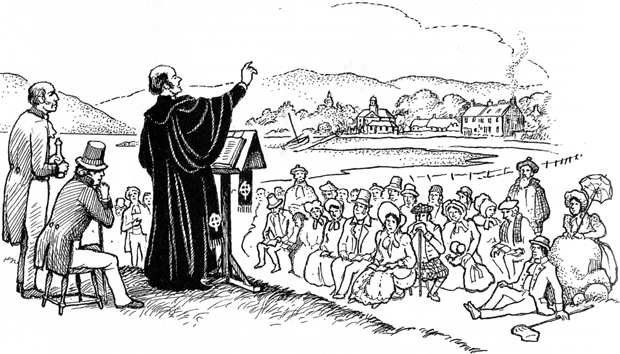 Sketch of Mr Campbell preaching his farewell sermon at Rhu by Helensburgh artist Neil Macleod for the Heritage Trust book '200 Years of Helensburgh'.